CHICAGO (AP) — The Chicago Cubs left struggling reliever Carl Edwards Jr. off their roster for Tuesday night’s NL wild-card game against the Colorado Rockies. Edwards had a 5.14 ERA in 11 September appearances. He walked 12 in seven innings. Manager Joe Maddon said Edwards also is dealing with a forearm strain. “We wanted to be very careful right now, and we thought if we did not push him right now, he would be available for the next series,” Maddon said. The Rockies had three catchers on their roster for the single-elimination game: Chris Iannetta, Drew Butera and Tony Wolters. They opted for 10 pitchers, including former Cubs closer Wade Davis, and 15 position players. 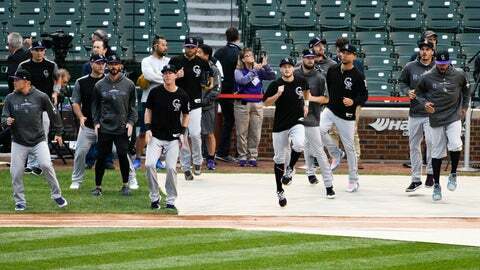 “Some other clubs might have a few more tough decisions based on the, maybe some of the experience and tenure of their roster, but in our case, it was pretty straightforward,” Rockies manager Bud Black said. Reliever Pedro Strop, who has been out since Sept. 13 because of a hamstring injury, is one of 11 pitchers on Chicago’s roster for the game at Wrigley Field. Speedy outfielder Terrance Gore also is active. Chicago and Colorado each dropped tiebreaker games for their respective division titles on Monday. The Cubs lost 3-1 to Milwaukee, and the Rockies fell 5-2 to the Los Angeles Dodgers.